Wall Street stocks finished with solid gains after a rollercoaster session, winning back a good portion of the losses from the prior session's rout. At the closing bell, the Dow Jones Industrial Average stood at 24,915.45, up around 570 points, or 2.3%, near its session peak. The S&P 500 jumped 1.8% to finish at 2,695.29, while the tech-rich Nasdaq Composite Index jumped 2.1% to 7,110.92. However, European shares closed down more than 2% as a violent global sell-off in stock markets and spike in volatility shook investors. In London, nearly £50 billion was wiped off the FTSE 100 as it ended the day down 2.6% or 193.58 points at 7,414.4 points. It marked its lowest close since April 2017 - a decline mirrored by both the German Dax and French Cac 40, which each dropped 2.3%. Dublin's ISEQ index ended the day down 1.42% at 6,658.71. 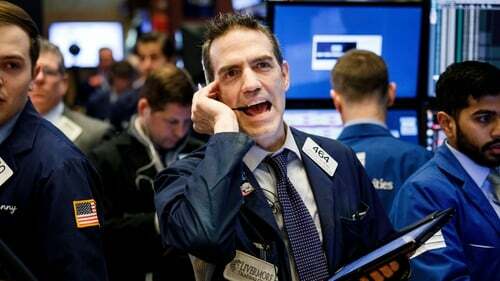 Earlier, Asian markets also saw steep losses as inflation worries gripped financial markets, sending US stock futures sinking further into the red after Wall Street suffered its biggest decline since 2011. Last night on Wall Street, the S&P 500 slumped 4.1% and the Dow 4.6%, suffering their biggest percentage drops since August 2011. Before last night's fall, the index had not seen a pullback of more than 5% for more than 400 sessions, which analysts said was the longest such streak in history. Earlier in Asian trade, Taiwan shares lost 5%, its biggest since in 2011 and Hong Kong's Hang Seng index dropped 5.1%. Japan's Nikkei dived 4.7%, its worst fall since November 2016, to four-month lows. Why are share prices falling and what does it mean? The trigger for the sell-off was a sharp rise in US bond yields following Friday's data that showed US wages increasing at the fastest pace since 2009, raising the alarm about higher inflation and with it potentially higher interest rates. That could be painful for markets that have been propped up by central banks' stimulus for many years. Some analysts also say markets tend to get edgy when the US Federal Reserve has a new leadership. The new Fed chief Jerome Powell, who succeeded Janet Yellen this month, is expected to continue Ms Yellen's stance of gradual tightening. But some investors regard a change in the Fed leadership as a source of policy uncertainty.